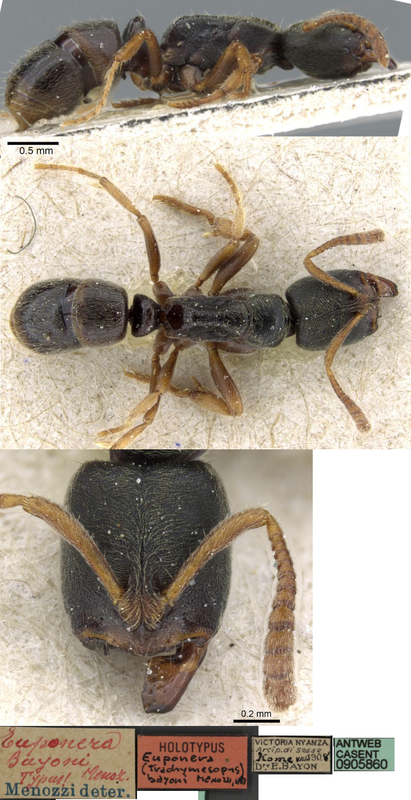 Type location Zimbabwe (Pachycondyla (Ectomyrmex) brunoi, Forel, 1913j: 205, worker; Arnold, 1915: 54, male; Arnold, 1926: 201, queen; in Ectomyrmex Wheeler, 1922: 774; in Trachymeopus Brown, 1963: 8; new status Schmidt & Shattuck, 2014: 86) collected at Bulawayo. 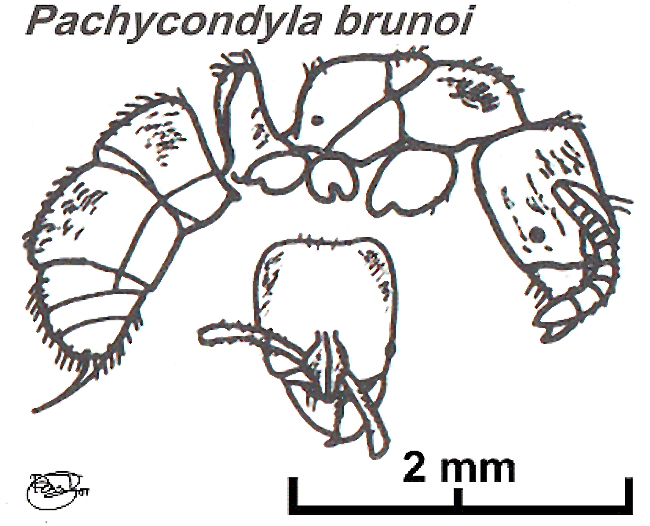 bayoni (Euponera (Trachymesopus) bayoni n.sp., Menozzi, 1933a: 97, worker) from Uganda, Kome, Sesse Archipelago - see below. dentis (Euponera (Mesoponera) dentis, sp. 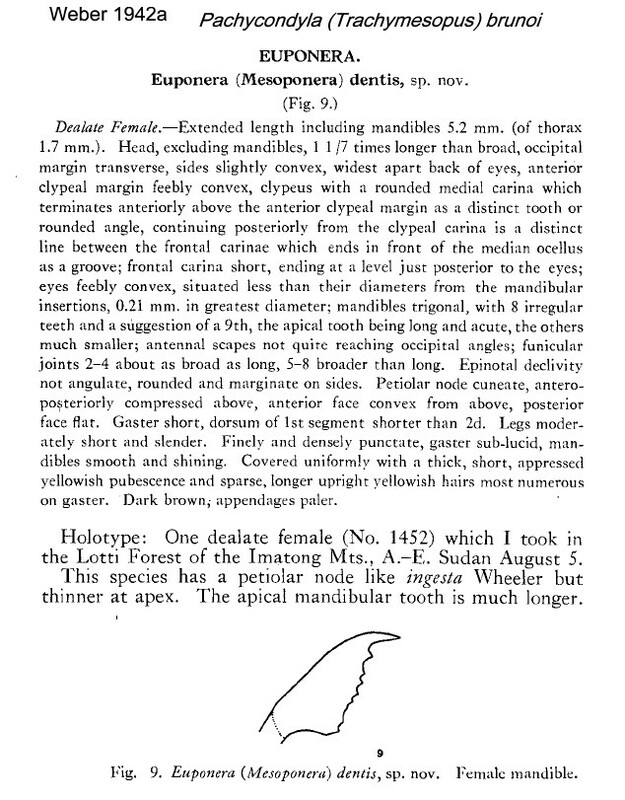 nov., Weber, 1942a: 43, illustrated mandible, queen) from South Sudan, Lotti Forest, Imatong Mts - see below. all forms known (see Bolton, 1995). Synonymy by Brown (1963) . "This species occurs widely in Africa south of the Sahara. In addition to the types mentioned above, I have seen samples from Liberia, Cameroons and the Kalahari Desert. There is some small variation among these samples in relative head width and in strength and opacity of the sculpture, but this appears to be both size-linked(allometric) and continuous." TL 4.75 mm, HL 0.96, HW 0.93, SL 0.68, PW 0.68 . Colour black, red-brown extremities and appendages. Sculpture of fine dense puncturation, relatively dense pilosity all over. Mandibles with a basal fovea on dorsolateral surface. 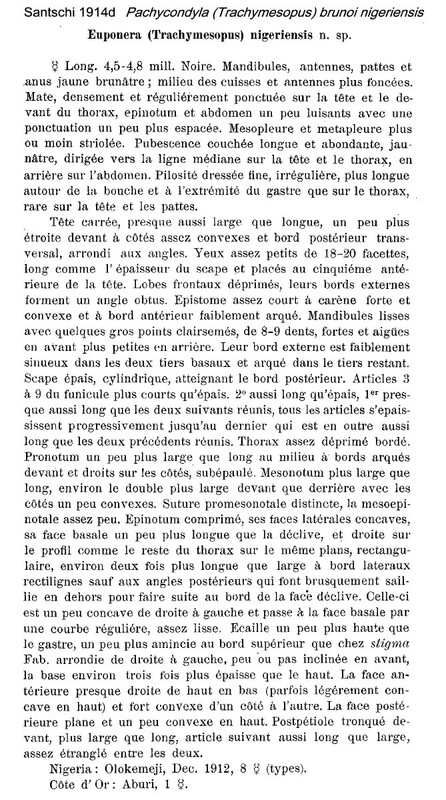 Clypeus carinate medially. Eyes small. Metanotal groove very weakly impressed. Dorsum of propodeum narrower than that of pronotum. Wheeler (1922) listed nigeriensis from Ghana (Aburi, F. Silvestri). 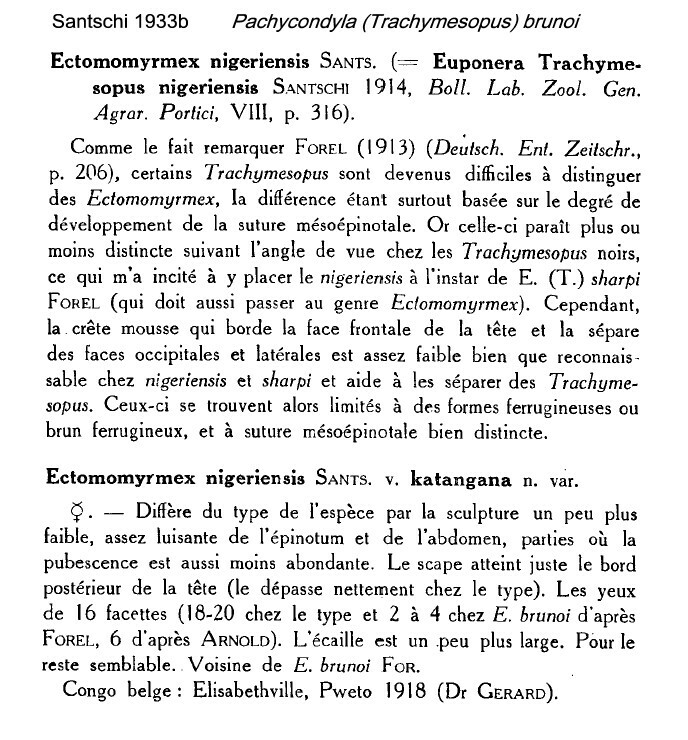 From Guinea, Bernard (1952) recorded a single dealated queen (as Euponera (Trachymesopus) lamottei), collected from Kéoulenta savanna (27-iii-1942, Lamotte), remarking that the nearest relative he had seen was Euponera sharpi Forel, known by workers only from Singapore. Brown (1963) reported that, in addition to the types, he had seen specimens from Cameroun, Liberia and the Kalahari Desert and that there was some small variation in relative head width and in strength and opacity of the sculpture, but that appeared to be both size-linked (allometric) and continuous. 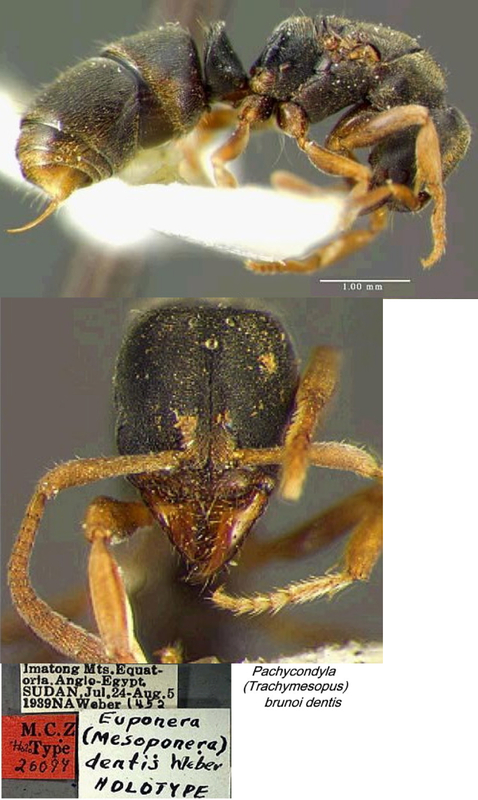 In Nigeria collected in soil and from a dead log (B. Bolton), often found with termites (Bolton, 1973a). Described as widespread in the Ghana semi-deciduous forest zone, from leaf litter sampling, 24 workers, and soil, 9 workers, by Belshaw & Bolton (1994b). The photomontage is of a worker from Gabon, Pongara Camp Base; collector Yves Braet (Gabon 178). The photomontage is of a worker from Liberia, Yekepa; collector E Poiriet (Yekepa PF XVI). The photomontage is of a worker from Benin, Tchatchou; collector J-F Vayssieres (RVA 3091). The photomontage of the holotype queen of dentis is from the MCZ website.